This day was another day of exploration. Granted we had to buy our return ticket back to Buenos Aires for Thursday, we all grabbed a cab and headed down to the bus terminal to purchase our tickets. From there we walked around the neighbourhood, exploring more of the shops and ended up walking towards the beach at the other end of the main beach. We all (my mother, aunt Nelly, Russ and I) sat and enjoyed the day as we all took a short break from walking. We then grabbed a cab back to the apartment and had our lunch. Russ and I then decided to head back to the bus terminal and do alittle bit more exploring and hook up with a internet cafe so I could try to upload my photos to Flickr. I say “try” as the internet here is very slow and it took us over 1.5 hours just to upload 25 photos. I gave up after that and we continued to walk. 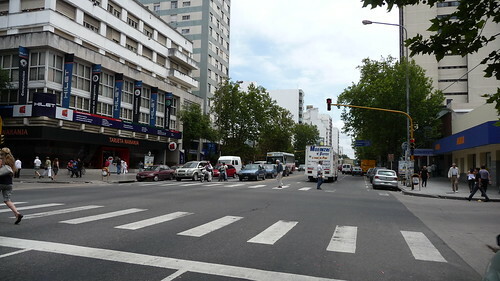 We walked for several blocks, pass the main plaza, pass the casino and to a pedestrian street called “San Martin” which is full of shops, cafes, and other nicknacks for several blocks. We continued up the street and reached a huge plaza where there was a Cathedral Church where people where gathered and protesting something. I wasn´t sure what they were protesting at the time. After a walk around the plaza (park), we walked back to the apartment and rested abit as our walk was about 5 hours long. Later the whole gang went to another Asado restaurant, where we enjoyed a great dinner. My Father, Russ and myself then headed to the Casino for a “guys night out” and tried out luck at the Roulette tables. I was, or at least I shouldn´t have been, but Russ won on his first try at the Roulette tables. I sadly lost my 40 pesos very quickly! My father did have fun and we all arrived back at the apartment after 1am in the morning. Tomorrow we have our last 1/2 day in Mar Del Plata and then head back to Buenos Aires on the bus and hopefully we´ll see some great places along the way that we didn´t get to see when we first drove down. We had a fantastic rest last night. I can’t believe I was finally able to sleep. We had a late start to the day as we didn’t make it out until after 12 noon. We had decided today wouldn’t be a “beach day” but it would be a day where we would go out exploring the city and see what exciting things we could find. Russ, my mother and aunt all went out walking to one of the main avenues here in Mar Del Plata, but quickly learnt that most stores (even though its in a tourist area) close for the afternoon. Most wouldn’t open up until 4:30pm that afternoon. From there we took the bus (you can buy a card and put any amount of money on it and use it on any of the buses) and went down to the main Casino on the beach. As usualy Russ won on the slot machines, while my aunt and I walked around. My mother had fun playing on the slots as well, but was asked by one of my other aunts to play roulette for her. I have never played roulette nor had my mother so were not versed in the proper way of betting. For a casino, there were tons of roulette tables around. I think the only odd thing was to see 3 Blackjack tables and that was it for this casino. Granted we were there during the day, it did seem alittle odd to only have 3 open. Also it was fairly quiet for the casino. We later then walked out to the front courtyard and sat and took a few more pictures of the beach and area. We got home later and rested for abit and then went out to have some dinner at an Italian restaurant that wasn’t the greatest I have to admit. Overall the day was fairly quiet and nothing more was done. We are planning on only being here until Thursday when we will head to Ramallo for a few days until we make it back down to Buenos Aires to stay for the remaining time. WiFi has been hard to find and the connection when found is VERY slow to say the least thus, it has taken sometime to get my photos uploaded for everyone to see. Finally in Argentina and even though my right hear still hasn’t popped from the pressure of the plane, I’m still enjoying the vacation so far. When we landed in Buenos Aires, we had hoped that my father would be waiting for us to drive us to my aunt’s home, but alas that wasn’t the case. Instead my mother paid for our ride into the city via a “Reme” (a combination of taxi and private chauffeur). At my aunts house we were greeted by my father and his two sisters (my tia Tita and tia Nelly). These two sisters are very inseparable and always fun to see. I quickly got myself settled and took my long awaited shower (after 20 hours of flight it’s time to have a routine again). Russ and I began to explore the neighbourhood a bit and walked around. This area alas has begun to get a bad reputation as being a harsh neighbourhood, but at the sametime people take pride in their homes and it shows. Homes are all gated, but they decorate them with a passion that I have not seen in sometime. Some homes have a front yard where they have manacured lawns, have flowers and some banana palms. Also the homes always have a centre court yard where most of the family usually gets together and is the heart of the home. We finally arrived in Mar Del Plata at 6:30am and we got to our appartment shortly after that. As not one of us had eaten, we all went out for breakfast. Argentinian’s are not very big on breakfast as it usually consists of coffee and pasteries. After breakfast we walked around a bit to get orientated and discovered that the beach is only a few short blocks from the apartment. 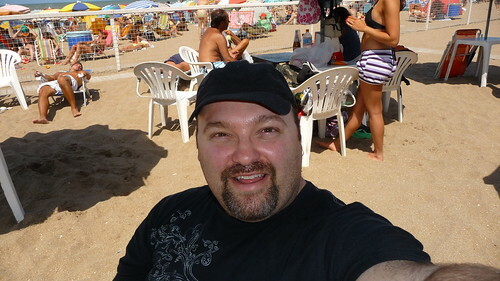 The beach we were on is known at the most popular beach on Mar Del Plata known as Perla Norte. They have areas broken down where you can rent a cabana, rent a table with umbrella and a public area which is a free for all. The cost to rent a cabana is $100 pesos ($33 US), a table and umbrella is $90 pesos ($30US). Since we wanted to have a secure place on the beach we rented the umbrella and table for the day. We spent time on the beach and just relaxed. 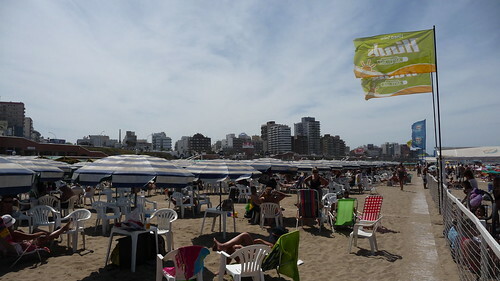 It was interesting to see that most Argentinians don’t head to the beach until after 12 noon and the beach becomes fully packed around 3pm that day. As this is prime holiday season here, the beaches really fill up. Later that evening we went out for an authentic Argentinian bbq dinner (or parilla). We ordered the dinner for 5 which consisted of several different cuts of beet, chicken and pork that were brought to our table. A truly amazing tasty treat that we could not fully finish. We walked around the town, which now could be called a city as amount of people and the streets are bussling all the time. I have to say I am looking forward to a good nights sleep as I really haven’t had one since Friday night. Tomorrow is the day I embark on my 2 week vacation to Buenos Aires Argentina. Yet I am at home nursing a cold that will no doubt be a burden when I fly tomorrow. This has been a trip I’ve been wanting for sometime as I just haven’t been able to go before. It will be wonderful to see my family again and to explore the many offerings the capital city has to offer. The last time I had gone was about 10 years ago during the Easter holiday. I had planned to visit all my relatives, but during that time my grandmother fell and broke her hip bone. It was hard to see and deal with during that time, as she never really recovered and saddly passed away a few months after that. This time around I hope to visit the family members I didn’t get a chance to visit the last time. I had hoped to have gotten together with my Uncle Tito, but saddly he passed away last year. It will be a somber trip, but I know I wll have some fun, after all Russ is joining me on this trip. It is Russ’ first time to South America and he is looking forward to exploring the Paris of South America. I hope to blog during my visit and let everyone know about several of the wonderful neighbourhoods.